Description of Project: Moscow’s vision is to build a world-class, dual-language, multi-modal transportation network to improve the experience of the city for citizens and visitors alike. To help realize this vision, Moscow Department of Transport (DOT) commissioned the creation of a unifying visual identity and wayfinding system to seamlessly integrate all forms of movement across the city. City ID were commissioned to develop the multi-modal wayfinding program, from strategy through to system implementation, commencing with the city’s iconic Metro system, the jewel in the crown of the city’s public transit system, which is used by nine million people everyday. The aim was to improve the flow of people through the complex station environments, some of which have as many as fifteen exits and multiple transfer options. The main challenge was conveying the complicated environments clearly, whilst revealing transfers and end destinations, as the length of walk involved in making a mistake is significant. 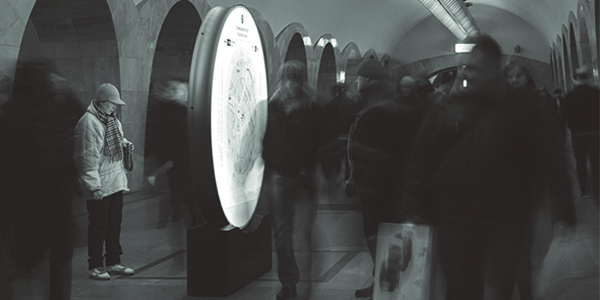 The scope was to develop a wayfinding and information system with a bespoke graphic identity to support greater connectivity and transfer between modes for Moscow. Project stakeholders and members of the public were consulted at various times throughout the evolution of the system, from mental mapping exercises to testing full size product mock-ups in situ. Insight and feedback consistently informed the process to influence design decisions. A bespoke range of products have been designed and manufactured, to respect and compliment the environments in which they are situated. Every product is created for its specific location, providing tailored travel choices to enable people to move with confidence and identify their transfer, or guide them to their final destination with ease. Exits have been allocated numbers to allow people to follow them on direction signs along platforms and corridors. Intuitive maps and diagrams were designed to help people make informed decisions and act upon them with efficiency. These included heads-up pedestrian maps at key decision points, showing the city above ground when viewing it below ground, with subterranean routes overlaid onto geographic maps, in order to help people decide which exit to navigate to. Required map resources were defined and created, together with a strategy in which to organize and manage them. A product range of 17 sign types was developed for the system, providing information that is tailored to a wide range of key journey stages and locations throughout the transport network. A placement and positioning strategy with supporting training program was developed to capture the approach and principles in which to locate various sign types within Metro Station environments, together with a rollout and budget plan for implementation.